The reward at the end of this rather long and strenuous hike is getting to see one of the largest rock arches in the world. The Blackwater Natural Bridge trail is a great place for a good workout and has a great reward at the end. The natural bridge ranks in the top five worldwide for size, so it’s definitely worth the effort. This trail often opens late in the spring depending upon the previous winter’s snow depth and may have some downed timber you’ll have to climb over. Check with the USFS Wapiti Ranger Station in Cody on current trail conditions. 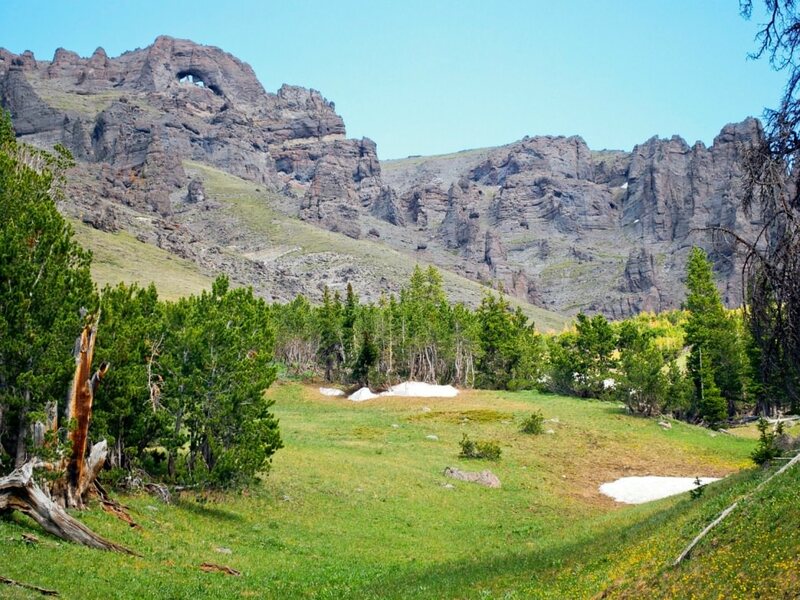 This trail offers great scenic views of the surrounding Absaroka Mountains. The first 5 miles of the trail wind through an old Douglas Fir forest and a riparian zone. There will be several creek crossings and drainages so be prepared to get your feet wet. The trail then makes a fairly steep ascent to the ridgeline and an alpine meadow. From here the actual trail can be hard to find but you can continue south/southeast toward the top of Sheep Mesa. This last section is just over a mile in length but is quite steep. The best views of the natural bridge are from the top of Sheep Mesa, but be aware this is an exposed area and shouldn’t be attempted during afternoon thunderstorms. You’ll feel like you’re on top of the world when you summit Sheep Mesa. Following the main trail is easy, but be aware there are several side paths in this area which lead to horse camps. If you want to visit the Blackwater Fire Memorial take the left hand trail after the 1.4 mile mark and head southeast. The memorial commemorates the deaths of 15 wildland firefighters in 1937. If you’re looking for a more primitive trail experience and a chance to really work those legs and lungs, this is the hike for you. This is big mountain country that constantly teases hikers onward and upward with awesome vistas and great views around every bend. Those new to the backcountry or who are slightly nervous about being in the wilderness would better appreciate some of the other Cody hikes. There are two parking areas depending on the time of year. Before July 1, park at the Firefighter’s Memorial on the North Fork Highway, 37 miles west of downtown Cody on Highway 14/16/20. After July 1, drive up the North Fork Highway to the entrance of the Blackwater Creek Guest Ranch. Drive through the ranch up the Forest Service road for 2.1 miles to the second parking area. There is a gate on this road which isn’t open until July 1. The open gate will save you an hour of walking. There’s ample parking for several cars. No fees are required and your leashed dog is welcome. Be aware of hunters in the fall. Check at the Shoshone National Forest Wapiti Ranger Station in Cody to get current trail conditions and to find out about access.